What is My Maryland Personal Injury Case Worth? How your injuries impact your life? The value of your Md personal injury claim depends on all of these factors and many more. No Maryland personal injury attorney can reliably tell you what your case is worth without knowing the details of your claim. At the Law Office of LaSheena Williams, we’ll work hard to get you the maximum compensation for your Maryland Personal Injury Case. How Much Time Do I Have to Pursue My Maryland Personal Injury Case? No matter what caused your accident, there is a personal injury statute of limitations, a critical filing deadline, that impacts your case. If you miss this deadline, you won’t be able to pursue any personal injury claim at all, no matter how badly you are hurt. To avoid losing out on your legal rights, you should act quickly. The general statute of limitations for a civil suit in Maryland is three years from the date of your accident. How Long Will My Md Personal Injury Case Take to Complete? Your medical treatment is extended for a prolonged. Your case is particularly complex. The defending insurance company is uncooperative. Until a Maryland personal injury attorney know the details of your situation, we can’t tell you how long your case will take. We have resolved cases in as little as a few months, but others have taken several years. At the Law Office of LaSheena M. Williams, we are committed to getting you the most compensation with the least amount of waiting time. How Much Will a Maryland Personal Injury Attorney Cost Me? You are not alone in worrying about how to afford a Md personal injury lawyer. Fortunately, you won’t have to pay a single out-of-pocket fee to have an experienced Maryland personal injury attorney handle your Maryland Personal Injury Case in Prince George’s County, Maryland and Montgomery County, Maryland. As a Maryland personal injury attorney, my goals are to make sure your claim will not cost you any out of pocket expenses, and to help you obtain more money than you would likely receive on your own. 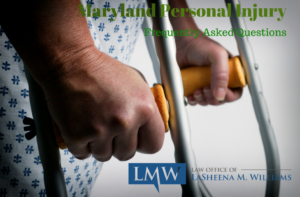 To learn more about how to receive compensation for your Maryland Personal Injury Claim, contact the Law Office of LaSheena M. Williams. We can help you understand your rights and protect your interests in a Maryland Personal Injury Case. Contact us by calling (301) 778 – 9950 or by completing an online request for a consultation. Our firm passionately represents clients across Rockville, Bethesda, Gaithersburg, Silver Spring, Takoma Park, Chevy Chase, College Park, Cheverly, Greenbelt, Oxon Hill, Hyattsville, Upper Marlboro, Largo, Bowie and surrounding communities.